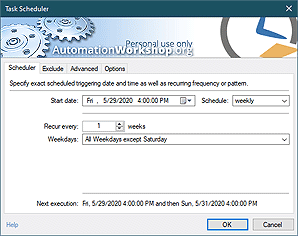 Whether performing normally or experiencing unexpected errors, Automation Workshop Free Edition always lets you stay in control. It is not enough that the processes are merely automated. Knowing what is happening in the system is essential part of daily business. Automation Workshop is fully up to the challenge by providing exactly the information you need. Not only it features customizable logging and reporting features, it also includes proactive error handling capacities that are suitable for effective management of the automated processes. Automation Workshop logs essential data on the Tasks it performs. From every bit of operation to somewhat general overviews, the level of detail is customizable to meet your specific needs. The operations of each Task can be both recorded into the main log file and, if necessary, to separate log file created only for the particular Task or group of Tasks. You can view the logs by using advanced built-in Log Manager. Log Manager offers multiple filtering options for quickly locating exactly the part of the log necessary. Log file export feature allows easy log file migration to 3rd party software or storage. Besides logging automated events locally, Automation Workshop also supports email reporting feature that is readily available for each Task. Both successful and failed outcomes can be automatically reported to the specified email. Besides the default Task completion email reporting, it is also possible to create custom email reports. Using the Send Email Action in conjunction with Variable Wizard allows retrieving and reporting dynamic values that have determined Task's execution. Either way, Automation Workshop provides options for timely and efficient email report delivery. While local logging and remote email reporting of your automated Tasks allow to quickly locate and eliminate most automation issues, it is also possible to design effective workarounds of somewhat expected or even utterly unexpected failures. On Error feature of Automation Workshop detects failure of a Task and automatically launches another Task which can be pre-configured either to do the same in another way or do something else to take care of underlying issue. View screenshots · see the look and feel of Automation Workshop. Automation Workshop provides all the functionality I need, out of the box, at no cost. It's free! —Colin A.